The judging panel placed the Equestic Saddleclip at the top in the category Training and therefore Equestic became winner of this category. 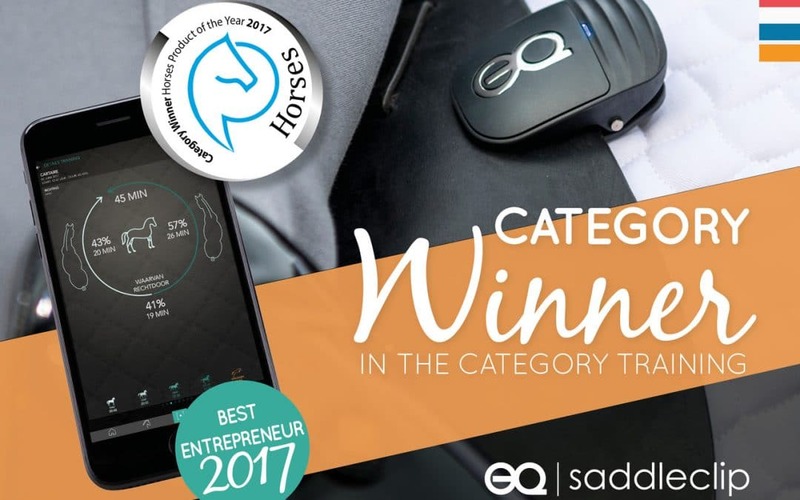 The SaddleClip is a very innovative training tool for horses and rider and together with the Equestic App it provides a bettter insight in training routines. As a result, the rider not only improves himself, it also contributes to a better well-being and better performance of the horse. With the Equestic App on your smartphone riders have easy access to the various analysis options. “With the Equestic SaddleClip you can monitor and improve your training routines. We are conquering the Dutch market and are expanding. We hope to go worldwide next year”. Leon Rutten, CEO of Equestic, also won the award for Best Entrepreneur. This award is for entrepreneurs who know how to conquer the market in a smart way and who have lots of passion for their profession. By introducing a new innovative product that visibly changes the market, Rutten has proven to be a real entrepreneur.